ST. LOUIS, MO - Black children are involved in reported cases of child abuse at approximately twice the rate of white children. Until now, this has generally been attributed to racial bias in the child welfare system. But in a new study published in the journal Pediatrics, F. Brett Drake, PhD, professor at the Brown School at Washington University in St. Louis, finds that much, if not most, of the overrepresentation of black children in maltreatment reporting is due to increased exposure to risk factors such as poverty. “Racism can exist in any system, but it does not appear to be the driving force behind the racial disproportionality in child abuse and neglect reporting,” he says. Drake also found evidence consistent with the well-known “Hispanic Paradox,” an effect commonly reported in health literature. It has long been noted that Hispanic families have relatively good child health profiles despite high poverty rates and poor access to health care. The current work found a similar dynamic relative to child maltreatment reporting. “Even though Hispanic families experience poverty at a high rate, similar to black children, their rate of reported child abuse and neglect was similar to that of white children,” he says. In the study, “Racial Bias in Child Protection? A Comparison of Competing Explanations Using National Data,” Drake and co-authors used data drawn from national child welfare and public health sources. 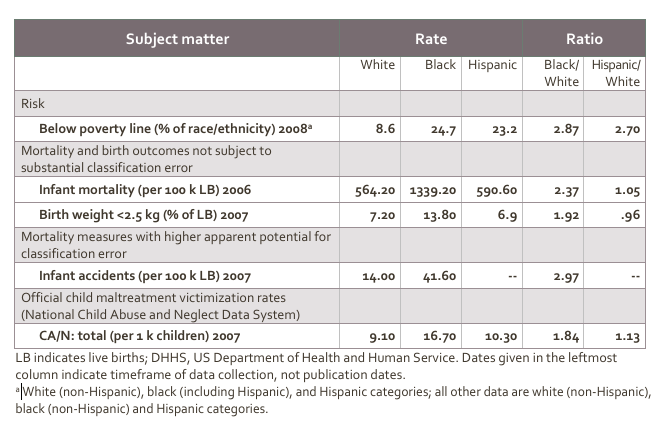 They compared racial disproportionality ratios on rates of victimization from official child welfare organizations with rates of key public health outcomes not subject to potential biases such as general infant mortality. “We do not deny the importance of uncovering bias in reporting or the need to understand culturally specific factors that may help buffer risk,” Drake says. But he says it is important to remember that more than 30 percent of black children live in poverty. “So long as our society permits such a large number of our children and young families to live in horrible economic circumstances, we can expect to see high rates of child maltreatment,” Drake says.